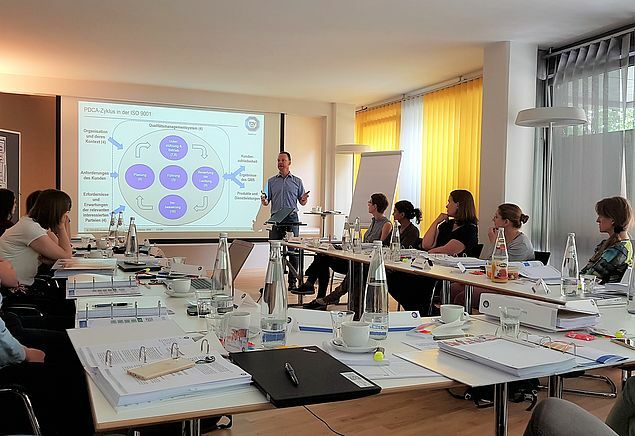 During a three-day workshop held in Berlin in mid-June, prospective auditors from the German Biobank Alliance (GBA) familiarised themselves with the theoretical principles of conducting audits. Fourteen employees from different GBA biobanks, one representative from the NAKO Health Study and two representatives from the German Centres for Health Research (DZG) attended the workshop co-organised by TÜV Süd. “Friendly audits” are expected to begin at GBA biobanks in the fourth quarter of 2018; audits in cooperation with NAKO and DZG are also planned from the end of 2019. The workshop marked the start of a two-part training programme for GBA auditors. The participants were first introduced to the DIN EN ISO 9001:2015 standard. “This standard provides the basis for establishing a reliable QM system. It is both the most common and most significant standard in quality management,” explains QM coordinator Christiane Hartfeldt. The workshop focused on auditing, whereby the DIN EN ISO 19011 standard formed the theoretical basis. Among other things, the workshop participants learned how to prepare themselves for future audits, what information they require about the respective biobank, and how to develop audit questions. They then simulated audit situations on biobank-specific topics in small teams and analysed these as a group. The second part of the training will be held at the Interdisciplinary Bank of Biomaterials and Data Würzburg (ibdw) at the end of August. The two-day course will concentrate exclusively on biobank-specific topics. Practical application will already begin in autumn with the first “friendly audits”. This article originally appeared in German on the GBN website.